I’ve rented a Rug Doctor on several occasions before. Typically it’s been at either points when I need the house to look its best, e.g. when the house is going on the market or usually when the stains get too much for us to just walk on by and pretend they aren’t there. 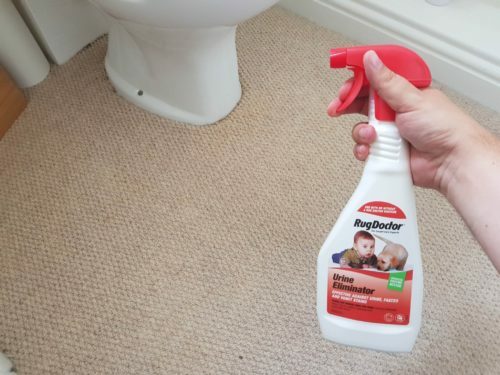 Sure I’ve tried interim measures beforehand, like buying all the cleaning products from the supermarket but sadly most of the time, other than smelling nice, the carpet or upholstery usually mostly looks the same as before. When Rug Doctor asked me to test out their products on Red Wine stains I immediately asked them if they were, or thought I was, crazy… Mrs F would absolutely go all wolverine on me if I even considered tipping Red Wine on the carpet to try out a cleaning product for the blog but I did say I had plenty of other stains which I’d be more than happy to take up the gauntlet on. I’m talking dried pen ink on our new carpet, multiple unidentified stains on my car seats which have been there (unable to remove) since I purchased it. We have recently had a new mattress and I wanted to donate our old one as it’s only a year old but I felt embarrassed as it had some sleep drool stains. Also having two children under the age of 8 means that sadly spilt blackcurrant is also a regular danger. 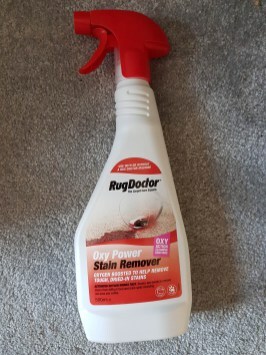 Coming in a 500ml spray, its core claim is that using its Oxygenated formula, it breaks down Dye Bonds, the stuff which colours the stain and breaks it down to allow blotting of the stain out of the carpets or upholstery. A couple of sprays on the stain and a short wait of a couple of minutes you’ll instantly notice a visual difference. Following the wait you can then blot out the remaining stain and enjoy a stain free zone. This pack of 20 wipes will become your new best friends. These smell gorgeous but make a quick impact on any freshly spilled stains such as tea, squash or even red wine. Measuring a decent 25cm x 20cm and a thick enough quality not to break up, these wipes will conquer any stain quickly. 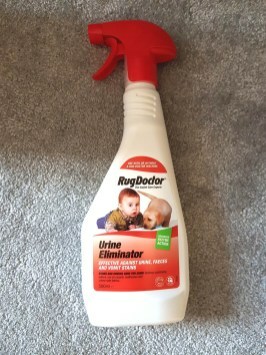 Despite its title, this doesn’t just deal with urine, it is also used for faeces and vomit where it both eliminates stains as well as the equally noticeable odours… We’ve all had our little ones vomit in their car seat and despite a good clean, you still get those occasional whiffs, well this product will eliminate both stains and odours. Again, coming in a 500ml spray bottle, this is pet friendly so can be used without worry and can also be used on mattresses. This one works without any blotting needed, just spray generously and leave to dry out. To say I was amazed is an understatement. 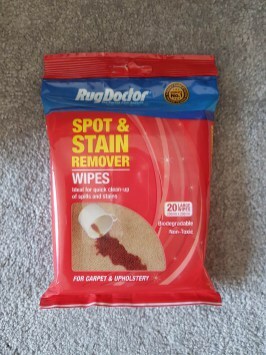 Both the Rug Doctor Oxy Stain Remover and Spot and Stain Remover Wipes worked incredibly well on everything I threw at them. I’ve never experienced such instant results using a stain remover before now. 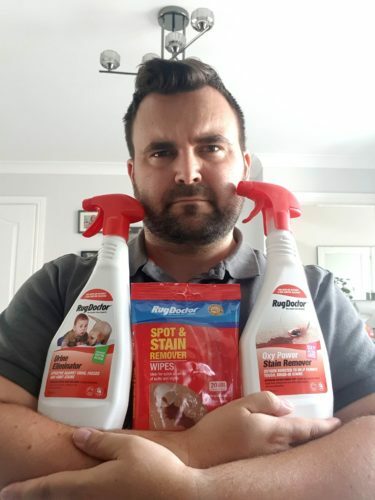 I will always look out for Rug Doctor from now on which makes complete sense… if we always turn to the main Rug Doctor carpet cleaner to do the business, then why wouldn’t the Rug Doctor cleaning solutions have the same effect too? Do you have stains you are struggling to remove? 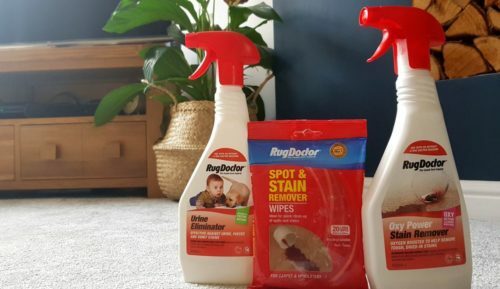 Have you tried out Rug Doctor’s cleaning solutions? Find out more about the Rug Doctor Cleaning Solutions and to find your nearest stockist check out the Rug Doctor Store Finder links now. This entry was posted in Carpet Cleaning Tips, Carpet Cleaning, Stain Remover. Bookmark the permalink.